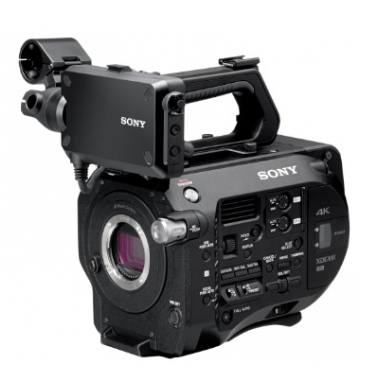 PXW-FS7 XDCAM camera has an ergonomic grip design for easy handling and operability, making it ideal for one-man operation in situations where the extraordinary flexibility of its α Mount lens system and compatible interchangeable lenses can be used to maximum advantage. The PXW-FS7 features a 4K Super 35mm Exmor CMOS sensor and support for shooting in 60p or Full HD at high frame rates up to 180 fps (frames per second). Selectable recording formats include XAVC, which supports 4K* 60p, Full HD 60p even in 4:2:2 10-bit recording, as well as the common MPEG-2 HD 422 format used by many broadcast stations around the world. Attach an optional Extension Unit (XDCA-FS7) to open up the possibilities of multi-camera shooting and ProRes 422 encoding. Connect an HXR-IFR5 interface and AXS-R5 recorder to support parallel recording and 4K/2K RAW recordings up to 240fps in 2K. The PXW-FS7 has a host of ergonomic design features including a grip design for easy handling and operability, and adjustable arm section. The PXW-FS7 supports internal recording at 4K resolution as well as a wide range of frame rates 59.94P, 50P, 29.97P, 25P and 23.98P), and provides outstanding sensitivity of ISO2000 and the dynamic range of 14-stops. The PXW-FS7 incorporates the α Mount System with an E-mount lens mount, ideal for the SELP28135G 35mm full frame powered zoom lens. The use of A-mount lenses via the LA-EA4 lens adaptor.